We’ve noticed that our buyers want move-in ready homes, and they are willing to pay more to get them. Buyers prefer not having to make any updates to the home before they can unpack their boxes. Making repairs, painting, and deep cleaning your home is paying off for sellers. RealTelligence recently completed an analysis on two homes on the same street, listed around the same time, with the same floor plan. One was completely renovated and the other wasn’t. The non-updated house decided against making improvements and opted to “discount” their house by $65,000 to compete with the updated home. The updated home sold in 17 Days for 96.47% of its original asking price. The non-updated home was on the market for 354 days and NEVER sold. The top five interior features our Tuscaloosa area buyers are looking for are hardwood floors, smooth ceilings, a master bedroom on the main level, plenty of closet space, and neutral paint colors. Speaking of paint colors, grey tones are in and earthy tones are out, and white or light colored cabinetry is more appealing to buyers these days than dark colored cabinets. When you sell your home, you will want it to appeal to as many people as possible, not just a small percentage. You might not be able to change the layout of your home, but painting and having the ceilings scraped could attract more buyers for little cost. Consider doing the work to incorporate in-demand interior features! Inventory is down in every residential market in Alabama. While there is a decrease of new homes being listed, the currently listed homes are flying off the market faster than they can be replaced. As a result, buyers are having to compete for their dream homes and many of our listings are receiving more than one purchase offer. These situations are great for sellers, but do need to be handled professionally. The last thing you want is to lose one or both offers because the buyers don’t want to get into a bidding war. Our agents are trained and experienced at helping both buyers and sellers navigate multiple offer situations. Ask our agents about how we help win bidding wars. 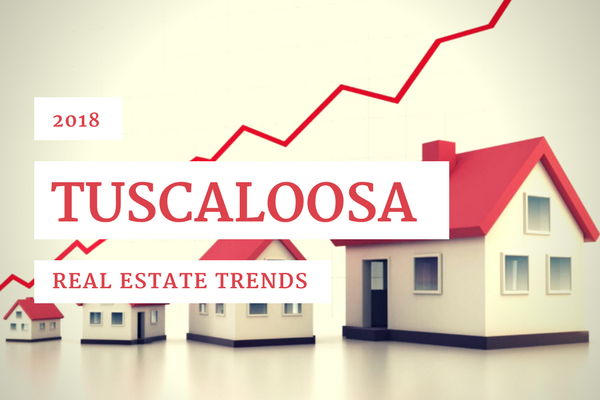 According to the Alabama Center for Real Estate, “Tuscaloosa’s January housing inventory totaled 839 units, a decrease of 15 percent from January 2017. January inventory increased 3.5 percent from December. Inventory has now declined 56.5 percent from the January peak (1,930 units) reached in 2008.” Low inventory is most likely responsible for the decline in average days on market. The five-year average for days on the market for January home sales is 113 days. That number dropped to 58 days in January of this year. While inventory is down, prices are up. The Tuscaloosa median sales price in January was $175,500, an increase of 17.1 percent compared to January 2017. The median sales price was up 5 percent from December.